He was born at Sarzana, Liguria, where his father was a physician. His father died while he was young, but in Florence, Parentucelli became a tutor in the families of the Strozzi and Albizzi, where he made the acquaintance of the leading humanist scholars. He distinguished himself at the Council of Florence, and in 1444, when his patron died, he was appointed bishop of Bologna in his place. 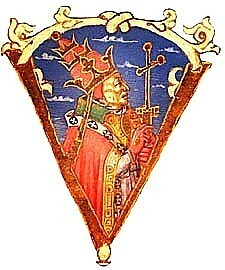 Civic disorders at Bologna were prolonged, so Pope Eugene IV (1431–1447) soon named him as one of the legates sent to Frankfurt to negotiate an understanding between the Papal States and the Holy Roman Empire, with regard to undercutting or at least containing the reforming decrees of the Council of Basel (1431–1439). Nicholas issued the bull "Dum Diversas" (June 18 1452) in response to a request from the Portuguese monarchy. King Alfonso V was conferred the right to "attack, conquer, and subjugate Saracens, Pagans and other enemies of Christ wherever they may be found." It gave title over all lands and possessions seized and permitted the Portuguese to take the inhabitants and consign them to perpetual slavery. The geographical area of the concession given in the bull is not explicit but Richard Raiswell argues that the use of the terms "pagans" and "other enemies of Christ" indicates the scope of the bull was applicable to the newly discovered lands along the west coast of Africa and that the ambiguity of the text was such that it encouraged the Portuguese to extend their explorations further afield. He further argues that the use of crusading language in the bull served to make the Christian-Muslim relationship the model for Africa. It is argued that collectively the two bulls issued by Nicholas gave the Portuguese the rights to acquire slaves along the African coast by force or trade. The concessions given in them were confirmed by bulls issued by Pope Calixtus III "Inter Caetera quae" (1456), Sixtus IV "Aeterni regis" (1481) and Leo X (1514) and they became the models for subsequent bulls issued by Pope Alexander VI : "Eximiae devotionis" (May 3 1493), "Inter Caetera" (May 4 1493) and "Dudum Siquidem (September 23 1493) when he conferred similar rights to Spain in relation to the new found lands in the Americas.